Sometimes sequels work out and sometimes they don't. 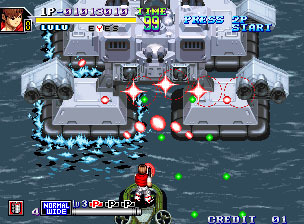 For every Magical Drop III and Metal Slug 3, there's a Samurai Shodown III. 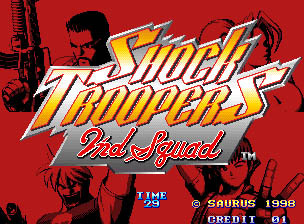 Shock Troopers: 2nd Squad isn't quite that big a disappointment, but there are enough things that feel "wrong" with this sequel that the original game outshines it. 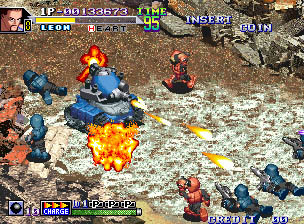 The Shock Troopers return, fighting a new terrorist organization known as DIO from a top-down perspective. And while it's nice to have our heroes back, it would even nicer if they were, in fact, our heroes--none of the original characters return for this second tour of duty, and there are only four characters (Leon, Toy, Lulu, and the incredibly well-endowed Angel) instead of the original eight. (It's so hard to find good help these days.) 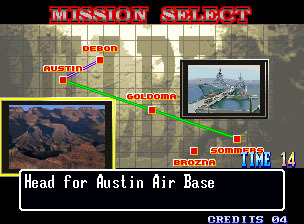 You'll square off against DIO forces at a naval base, in the desert, on city streets, and in plenty more places. Your goal's clear--blow away everything in sight and bring down the bad guys, and grab all the power-ups you can along the way for maximum points and maximum destruction power. The same fire-in-one-direction-while-walking-in-all-eight trick returns, so if you got good at it the first time, you'll have no problem adjusting. 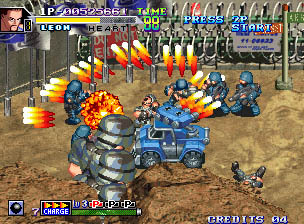 The big innovation this time is that players can jump into tanks and assault vehicles, armed with giant cannons and special weapons that make short work of road barriers and pedestrians. However, Saurus inexplicably swapped the functions of the B and C buttons, so if you're used to the original, you'll wind up throwing bombs when you want to leap out of the way. What possible purpose can this change serve? It's an annoyance. The graphics, too, seem to have been revised for the sake of revision. 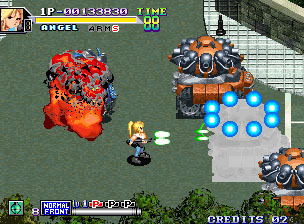 Characters are a bit more cartoonish now (please re-read the part about Angel's enormous bosom) and the game has less of a...serious look about it. (Note to future dictators: Do not try to take over the world with large-noggin soldiers that resemble plush toys.) Even so, the character animation is quite smooth and the explosions look even richer and more vibrant than last time. The game's biggest visual problem is slowdown--there are several times where there are just too darned many enemies on the screen, and the pace simply crawls, crippling the gameplay. Ho-hum action-movie music is joined by death throes that sound uncannily like the bleating of seals. The announcer sounds like he's phonetically speaking English (because he probably is) and characters have mediocre catchphrases--Toy says "Rock with the beat!" while Leon mumbles something about "forgiveness on the battlefield." But really, it's the seals that will get on your nerves. There are multiple paths to choose from but less characters and less flexibility than the first game. Plowing through the levels with a friend is always fun, however. 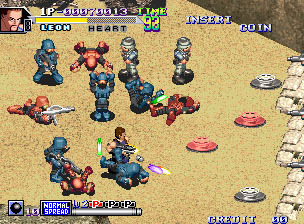 The whole of Shock Troopers: 2nd Squad is greater than the sum of its parts--the game is more enjoyable than you might think, based on some of the criticisms. But as Lulu says, "Who are you trying to kid?" This sequel isn't better than the original game, but it's an amusing diversion all the same. 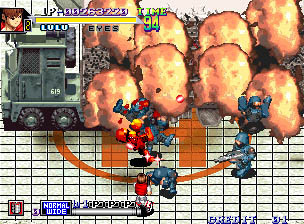 And hey, it's better to have a halfway-decent, slowdown-plagued, throw-continuity-to-the-wind sequel to a deserving game like Shock Troopers than none at all.